we went to the Lake District last week and went to Windermere while we were there. This was a rare sunny day. The water shone and the trees looked beautiful at the edge of the lake. We had other days which were rainy so drank lots of tea to keep warm! Last week we received a cheque for £200 from a donor who wishes to remain anonymous. We don’t want to make a big thing out of it, but thank you! Dress code: Red. Think Christmas, think oriental think red. Write a cheque payable to “stuff4sam” and email us at stuff4sam@gmail.com to find out where to send it. Buy tickets directly from Henny, Madeleine, Debbie, Hugh, Mod, Yolanda, Neil or Chris. All ticket purchases will be acknowledged with an email receipt. If you have any queries regarding tickets and payment please contact Yolanda on 07946 63 02 22. On Friday we had a crafty lunchtime to see what people were making for the sale on 1 December and to learn some new techniques. Neil brought in his amazing heat gun and showed us how to make fantastic silver and gold decorations for Christmas cards. We are getting very excited about what people are making and want to buy it all for ourselves! 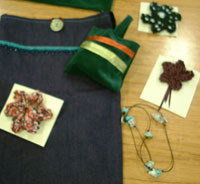 There will be some gorgeous hand knitted scarves and flower brooches, handmade bags of all sizes (each one a one-off!) , beautiful unique Christmas cards, plants, food, jewellery and other surprises. 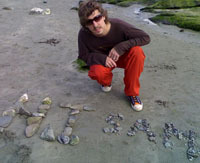 We are aiming for £500 to add to Sam’s fund. The good folk of Peterborough will be well prepared for the imminent cold snap if the results of the Scarf Sale are anything to go by! £200 was raised by the knitting team who made over 50 scarfs in various shapes, sizes and colours. More news and photos coming soon. Many thanks to all the committed knitters who took part. Today our total reached £12,000! £13,000 should not be too far away if the results of the Peterborough scarf sale are anything to go by (news coming soon). The London Christmas Craft Fair and party follow in December and should raise lots too. Clearly somebody somewhere can’t resist a spot of Mill’s and Boon or perhaps it’s the waiting list for Rupert Everet’s “Red Carpet and other Banana Skin’s” that has boosted sales (ah the joys of salacious gossip), but the ongoing book sales in London and Peterborough have now hit £1000! This is a magnificant total reached by the sale of donated books at 50p a go! Thank you everyone for donating and buying. If there are any more books out there looking for a new home then bring them in! 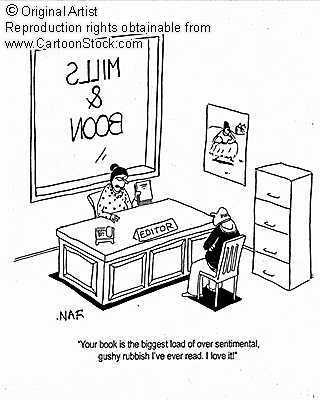 “Your book is the biggest load of over sentimental, gushy rubbish I’ve ever read. 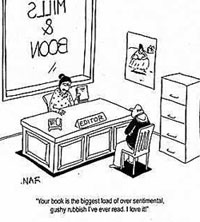 I love it!” Said the Editor to the Writer. 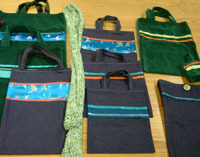 Items for the Christmas craft fair are starting to come in. 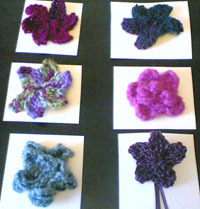 Here are a selection of beautiful knitted flower badges. They come in a range of colours and sizes – a perfect gift for Christmas! If you want to contribute to the sale email stuff4sam@gmail.com to find out how. Peterborough are holding their scarf sale tomorrow – watch this space for pictures and an update of how quickly they sell out! We went to Cornwall last week and had to visit Looe while we were there because it has such a silly name. We forgot to take one of your “hi sam” banners with us so we had to make our own using stones. I hope you don’t mind! 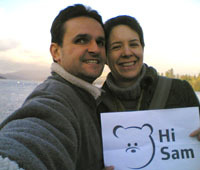 Hi Sam from New Zealand and Japan! we went on holiday to New Zealand and came home via Japan. These photos show Kathryn hiking on a glacier in NZ and Kevin in front of high buildings with lots of Japanese advertising in Tokyo.